Secondary classroom décor can be a touchy subject. It’s easy to consider it the domain of primary educators, or feel afraid of being judged by students or other teachers for trying to be cute or not treating students as near-adults. In this podcast episode I’ll be sharing ideas for decorating your classroom in fun creative ways that honor the age of your students and your own life and personality as well. I still love to work in a beautiful space and I’m far older than your students, so I’m willing to bet they’ll be happy if you try out a few of these ideas. Decor all starts with the door. Should we decorate it or not? Personally, I'm all for it. Here are a few simple, age-appropriate ideas. #1 Student photo collage – take class photos on the first day of school. Let students choose a location on campus and pose however they want (within reason). I've had entire classes climb trees, lay on the football field, sit in the bleachers, even try to make a human pyramid. Print your class photos and put them on the door. Then add more as you snap shots throughout the year when students are displaying projects, putting on performances, participating in festivals, etc. #2 The Coloring Book Door - I already wrote a whole post on this, so if you're interested, check out how I did mine! This is an easy and fun door with tons of potential. #3 The Instagram Door - Instagram doors abound on Pinterest. But rather than doing it yourself, I suggest you have each student bring in one square photo with a caption that shows them doing something they love or visiting a place they care about. That way your Instagram door represents your whole community and not just you. #4: The List - Cover your door in white paper and have students write up every book they read all year. Add yours too. Every day as students come in they will see new titles and ideas for their independent reading. Invite students to write a quick sentence about the book or draw a picture, or put stars around it if they'd highly recommend it. Another great way to decorate your room is with book displays. They are colorful, interactive, and don’t risk being age inappropriate. You can decorate a significant part of your classroom with books on display and recommended reading posters. I love using the Big Huge Labs "Motivational Poster" tool to make book recommendation posters. 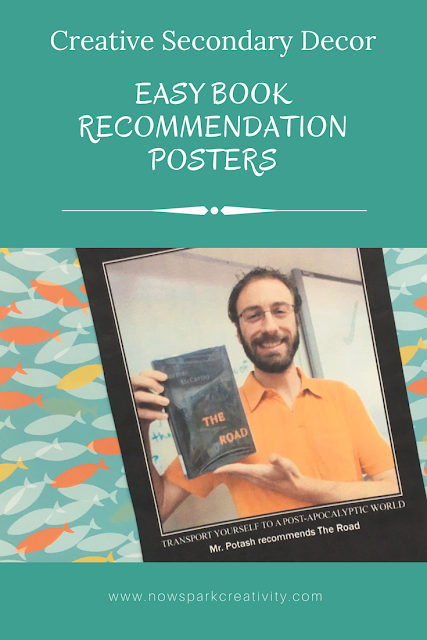 You just snap a photo of someone with their favorite book and then upload it to the poster and add your recommendation caption. These make great classroom decor, especially around your book displays. your family, doing things you love, and traveling. Let students get to know you better. I use my postcard collection to create all kinds of displays in my classroom, and also as story starters for journal writing. Build a postcard collection from your travels and ask friends and students to contribute. Soon you’ll be sharing images from all over the world with your students. Add literary quotations that relate to the images to draw them in. Travel may be a bit more broadening, but seeing a postcard collection on the wall every day is a good start to opening up your students’ horizons. I LOVE my student project hall of fame. It gives students the models they need to reach high. 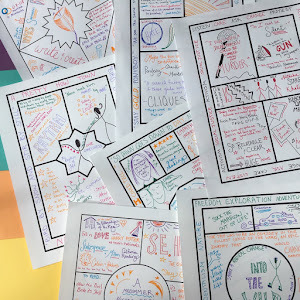 Collect best work and display it on a shelf or bulletin board, then draw students' attention there when you introduce a project with an example on display. 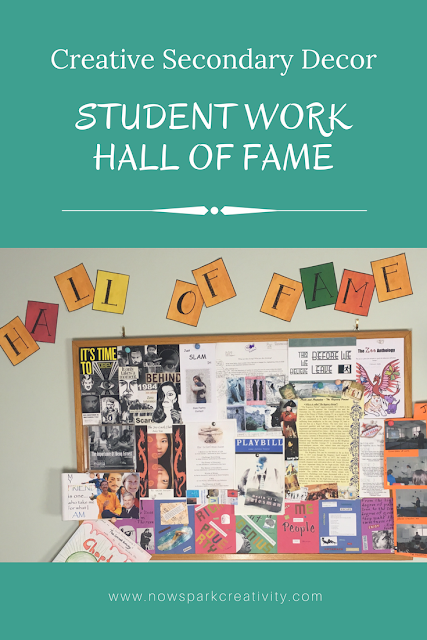 The hall of fame makes for a colorful and inspiring display on any classroom wall. To download the banner I made for mine, just click here. I hope these ideas help you get inspired to decorate your classroom in some fun new ways this year. I'd love for you to share your classroom photos (and ideas and questions) with our community over in my Creative High School English Facebook group! Just click to join. Finally, if you like to learn on the go and you haven't subscribed to The Spark Creativity Teacher Podcast yet, you can find it on iTunes right here.